Russia's hi-tech hub, the Skolkovo Innovation Center, is supporting cutting-edge biotech agriculture companies to enhance food supply. In late August, Russia's chief innovation hub, Skolkovo, launched a new department for agricultural biotechnology, hoping to reverse decades of decline in this field in Russia. As economic sanctions continue to bite, Russia must develop its domestic agriculture sector in order to replace banned food imports. Selective breeding in Russia lags behind other countries, lacking government support since the collapse of the USSR. "Most plant and animal breeds used today in Russia's agriculture are imported," said Yuri Nikolsky, scientific director of Skolkovo's biomedical technology cluster. "Many experimental facilities have been abandoned, and many scientists emigrated or pursued careers in other areas." Skolkovo's new agricultural biotechnology department hopes to reverse this trend, trying to seek out the best experts and determine the most promising and important areas. Since early August, Skolkovo has been choosing projects good enough to receive the resident status, which means they will get official support and investment. The precise priorities have not yet been defined, however. "Innovative companies operating in this field are so rare that there is no point in setting any precise parameters," Nikolsky said. Nevertheless, the goal is that by 2020 Skolkovo's biomedical technology cluster will have about 200 resident startups to implement biotech projects for agriculture and industry. Investment in such projects is expected to amount to about 5 billion rubles, and net earnings should total over 7 billion rubles. Mr Nikolsky says Russia has an opportunity to achieve considerable progress in certain scientific fields, such as genome selection. "One of our residents is a company from the Russian Far East that uses genetic manipulation to create new breeds," Nikolsky explained. ``Essentially, they create completely new species, whose genetics have not been studied at all. It is inherent for such fields that you have to start from scratch, so Russian selection breeding specialists are on an equal footing with their Western counterparts here." Genomic engineering is another field of opportunity, Mr Nikolsky added. While traditional selective breeding implies changing a breed gradually by developing certain traits generation after generation, genomic engineering can modify genes on the level of stem and embryonic sells. This means new species can be developed much faster, and this could help Russia close the gap with other countries. Some Russian scientific teams, such as the genomics laboratory of the Vavilov General Genetics Institute, already use genomic engineering in their work. Skolkovo is also interested in a project to breed frost-resistant oysters, led by a California-based company founded by scientists of Russian origin. The technology, developed by Professor Sergei Nuzhdin of South California University, could be used to produce oysters in the cold waters of the Russian Far East near Kamchatka. "Sea organisms grow faster in cold temperatures," Nikolsky said. "Oysters and sea cucumbers grown in the northern seas are far superior in taste, size and overall quality to those that are bred in the Yellow Sea. In this sense, Russia is very fortunate." We picked several Russian projects that could become Skolkovo's residents. A plant breeding team in Astrakhan, a city on the Caspian Sea, is creating a new breed of eggplant that is cone-shaped, pale green in color and has no bitterness at all. These eggplants do not need to be peeled because their skin is very thin even when completely ripe. The breed was created by accident; researchers simply noticed green fruits among the usual eggplants. 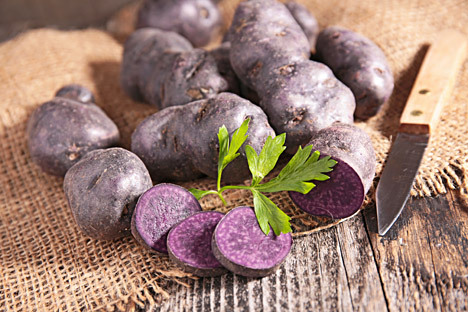 A few years ago, breeders from the Urals region created a breed of purple potatoes they dubbed "Chudesnik" ("Wizard"). Resistant to Russia's harsh weather conditions and containing increased amounts of antioxidants and vitamin C, Wizard was developed by crossbreeding an ordinary potato plant with its wild varieties. In July 2015, Russian plant breeders said they created a breed of watermelon that is orange-colored inside. Since the number of people intolerant to foodstuffs of certain colors is growing, these breeders hope that their creation will be in demand. The Novosibirsk-based experiment to breed a domesticated form of the red fox is widely known, and it has been included in many textbooks on genetics. This project has no agricultural applications, but scientists say domesticated foxes can be used to study basic mechanisms behind aggressive behavior, psychosis and depression in animals. Domesticated foxes are not only different in their behavior, but in their appearance as well; they display spots that make them look like dogs.